But only for Shiro/Jin musume and Equipment/Facilities. I'm searching inventory for event item, is that exist? It depends on exactly what you mean by event items. The construction materials from construction events are listed on the right side of the construction interface. Everything else you get from an event should be somewhere in the equipment, facilities, or shiromusu lists. 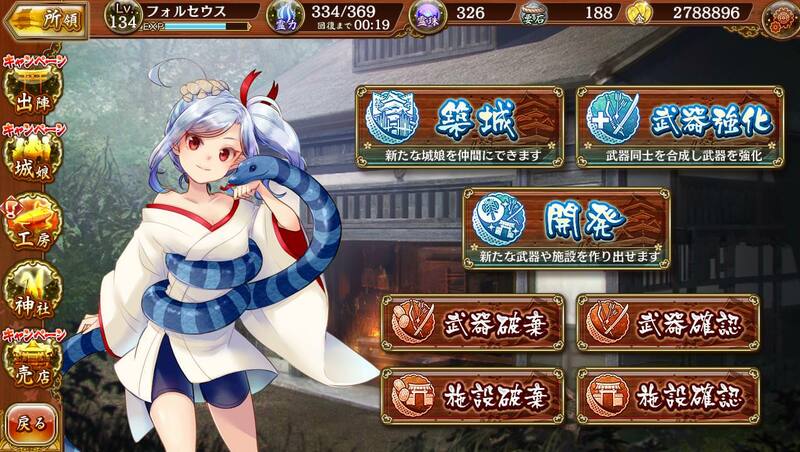 There are some other items, like the Yakumo and Senko orbs, and gift items, which are displayed in the interface for spending them, but none of those are directly related to events. The ki-restoration items that appear occasionally from events used to handled like items in an inventory of some sort from what I hear, but now they're simply consumed immediately upon being removed from the 'present box' interface. Fist/gauntlet: Short range fast attack? @ofi123 Regen is a basic stat for all units. Every 0.5s, your castle will heal half that amount of HP, which effectively means they automatically heal their Regen stat every one second. (It just increases at half second intervals). Regen is typically considered not too great because of how slowly it heals in the vast majority of cases. Some units will have Stratagems that multiply their base Regen, which allows them to heal very effectively though, such as the Madoka girls. Songs heal HP equal to their ATK stat every time they attack. Their attack speed is about 122 frames measured at 30 frames per second, so they attack roughly once every 4 seconds. This means they can do a lot of damage very quickly, but have limited range. Their high HP lets them tank bigger hits, but their low DEF means they can end up taking more damage from fast attacks. One of their primary ways of surviving is simply doing so much damage so quickly they kill the enemy before they can take many hits. Their low cost means it's also very easy to upgrade to heal, and they can get their skill out very quickly. Throwing Blades are really new and rare. There's only 3 in the game so far. Their damage output isn't super high, but they have high flexibility since they can go on any tile, and they have a lot of weapon options so they can fill a lot of roles, and from what we've seen so far, their Skills/Stratagems offer a lot of support. They're as fast as a Crossbow, but their ATK and Range is lower. DEF is slightly lower, but more HP. Their two main defining features is their true damage and their skill effect. Every Staff has a certain skill effect that activates when their skill activates, and they either affect all castles, or all enemies one time or for a short duration; i.e. Heal all Castles by 50% HP once, or deal damage to all enemies once. They have high DPS due to their high base ATK and DEF ignore, so they're very favourable vs armoured units or Spectres. Comparatively, Talismans have lower ATK and ASPD, but they get their slow debuff. Staves have very low range though, so it can be difficult sometimes for them to reach enemies. A lot of the time, you want to hold their final upgrade for a good opportunity to use it since it can change the tide of battle for many cases. Last edited by Folseus; 10-24-2018 at 09:42 PM. @ofi123 Those are to move units in and out of storage. Units in storage can't be deployed or used in any way. You can use this to store jinmusume or extra castles that you don't need immediately, etc. so you have more space for drops/crafting or your main teams. Hi! I just got into the game (dono level 15). Story map 1 - 22 was relatively easy, than I hit map 23 >_< (kinda feels like Kancolle 2-4 or 3-2). I've tried several placement strategy, all of which ended with the dono in a bloody mess. Do I need to put if different girls? I saw a youtube video clearing the map with 2x lv70 healers next to the dono, something which is impossible for me right now. Available (but undeployed) girls are sword-Bran, hammer-Yamanaka, crossbow-Uchi, ki generator-Yanagawa & Shikano. Last edited by Madcownivean; 01-12-2019 at 07:40 AM. When I was you. For making it easy, it need around lv 50. Here some video playthrough for you. It is good for reference. He did it on Hard difficulty. Maybe lv 40 is enough for normal with correct shiromusume. Normal is very easy than hard. And this is JP wikia if you need to know its mission's name and then you can copy it to youtube to search video playthrough. Hope it is useful. Sorry, I really forget my strategy back then. 1x healer (essential), 1 gun, 1 cannon, 1 hammer (must be tanky at the front), 1 sword, 1 spear/ki generator, 1 arrow, 1 throwing blade (but could have been another melee).